I was recently reading about the evacuation of White Helmets Al Qaeda linked operatives from Southern Syria. I think there was a feature on the great 21st Century Wire which was titled ‘Operation Paper Bag’ – because you would need one after hearing the story. Certainly for me, watching my country participate in evacuating terrorists complicit in the murder of Syrian civilians had a nauseating affect. At the time we were told that these ‘refugees’ would later be settled in the UK. Well, that came about this week when the UK government announced the first batch and their families had arrived for resettlement. But what had me reaching for the sick bag this time was this follow up on Twitter from Foreign Secretary Jeremy Hunt. If the evacuation of terrorists makes him proud of his country, I wonder what would make him ashamed. Does he honestly believe the White Helmets are heroes who have saved 115,000 people on all sides? I know he’s a new Foreign Secretary but it is hard to accept he actually believes’ this nonsense. 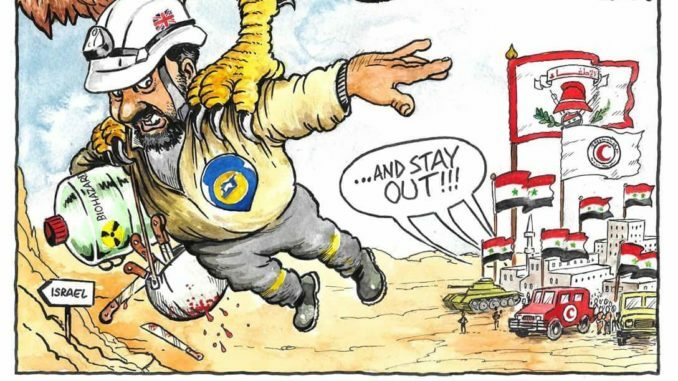 As other commentators have said, if the White Helmets are such heroes under attack by Assad why didn’t they re-locate to join their colleagues in Idlib – the last bastion of Western-backed, moderate, Islamist head-chopping rebels in Syria?. On second thoughts, perhaps it’s better to have them in the UK. At least this trash can’t inflict any more damage on Syria or escalate the conflict with chemical fabrications. But putting that aside for a moment, what if Jeremy Hunt is right and the mountain of evidence against the White Helmets is fake? Let’s just say for argument’s sake that Jeremy Hunt has superior knowledge to the Syrian people, independent journalists on the ground and respected academics. What if the White Helmets really are heroes of Syria? And on this basis, what can we do about the main body of White Helmets trapped in Idlib? Here’s an idea. I wonder if Jeremy would consider putting our renowned skills to good use in Syria. Perhaps for inspiration, he could look back at other ‘proud’ events in British history to achieve this. If there is one thing the British are good at, it is a large scale military evacuation. Although these followed disastrous military campaigns the British are known for superbly executing two major troop evacuations in previous conflicts. In World War I Britain evacuated virtually all its troops from Gallipoli, Turkey. And in World War II at Dunkirk, against all the odds, we evacuated 330,000 allied troops across the English Channel to fight another day. This was achieved by the British Navy and a large number of small boats supplied by the British public who rallied around to help. When the troops came ashore they were cheered and fed sandwiches by the public. After all, we created the ‘heroic’ White Helmets and Al Qaeda in Syria so its only right we take them back in their hour of need. I think the Syrian people would truly be grateful to Jeremy Hunt and the British people for taking them in. And I’m sure the British public will be most reassured by Jeremy Hunt’s statement that the ‘heroic’ and ‘selfless’ White Helmets could not possibly pose a threat to us. Kevin Smith is an ordinary British citizen living and working in London. He researches and writes down his thoughts on the foreign wars promoted by Western governments and media. In the highly controlled and dumbed down UK media environment, he’s keen on exploring ways of discouraging ideology and tribalism in favour of free thinking.